We are Building A Cabin! 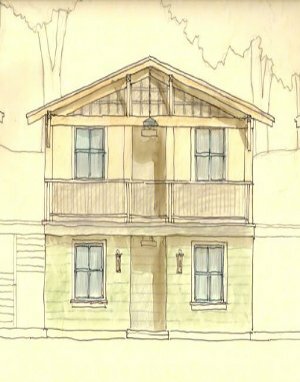 The camp will soon be undertaking a historic building project, to replace the dilapidated cabins on South Hill. The cost for these buildings is approximately $175,000 per cabin. Camp is well on its way to funding these cabins and has asked the EBA to step up, as we always have in the past. 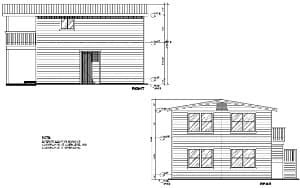 The EBA has taken this challenge and agreed to raise the funds to build one of the cabins, over the next three years. Emerald Bay continues to be on the vanguard of program development and implementation. As the camp looks to its future, it sees a facility providing programming opportunities for Scouts and the like enjoying shooting sports, marine sciences, ocean sports and more year-round 24/7. Please join us in providing those limitless possibilities to many more generations of adventurers! These new 3D renderings of the cabins were sent to us just recently. The cabins will be constructed in the area above the Eagle’s Nest (A.K.A. The Doctor’s Cabin), the Lighthouse (A.K.A. Lee’s Cabin), and the third, newest cabin closest to the big eucalyptus tree. These three cabins are shown in crude fashion in the first rendering, above. These cabins will be in the area currently occupied by the “Bayshore Bathroom”, “Wilson’s Warehouse” and the “Luxor”. Those buildings will be removed during the winter of 2013, but will remain for the summer of 2013. The original plan was to begin construction during the winter of 2012 / 2013. 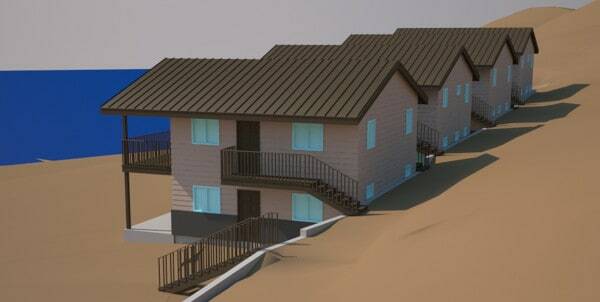 That plan included the extensive use of pre-fabricated construction methods; however, as the construction date came closer and the plans were finalized, it became clear that these construction methods and the costs associated with these construction methods would not be suitable for our needs. This construction delay turned out to be a good thing. We returned to traditional construction methods that would allow us to transport the materials to the island (the most expensive part of the process) and construct all the cabins at once. This allows us to add an additional two cabins were the Ambassador (A.K.A the Cook’s Cabin) currently is located. Construction is now slated to begin November 2013, allowing additional time to perform additional fundraising and avoid potentially costly financing fees. We are on track with the new construction schedule and we are slightly ahead of schedule with our fundraising goals due to some extremely generous donations from our membership. This does not mean that the project is over or that we can rest on our collective laurels; rather we must continue to remain vigilant and fulfill our pledges! Please consider establishing a recurring donation above. The program is administered through Paypal and makes it easy for nearly all of us to contribute to this landmark program! No donation is too small! As always, if you have any questions, comments, or would simply like to discuss the project further, please contact myself or our fundraising committee chairman, Rich Wise.